Anger is like a blazing flame that burns up our self-control and causes us to say and do things that we regret later. When someone is angry, we can see clearly that he or she is in hell. Anger and hatred are the materials from which hell is made. A mind without anger is cool, fresh and sane. The absence of anger is the basis of real happiness, the basis of love and compassion. When we are angry, we want to think about the person who is making us angry – his dishonesty, cruelty, and so on. The more we think about him or listen to him, or look at him, the more our anger flares. His hatefulness may be real, imaginary or exaggerated, but the fact is that the root of the problem is the anger itself and we have to come back and look first of all inside ourselves. It’s best if we don’t look at or listen to the person whom we consider to be the cause of our anger. Like a fireman, we have to pour water on the blaze first and not waste time looking for the one who set the house on fire. So we avoid thinking anything about the other person. At the moment you become angry, you tend to believe that your misery has been created by another person. You blame him or her for all your suffering. But by looking deeply, you may realize that the seed of anger in you is the main cause of your suffering. Many other people, confronted with the same situation, would not get angry like you. They hear the same words, they see the same situation, and yet they are able to stay calm and not be carried away. Why do you get angry so easily? You may get angry very easily because your seed of anger is too strong. And because you have not practiced the methods for working on your anger, the seed of anger has been watered too often in the past. All of us have a seed of anger in the depth of our consciousness. But in some of us, that seed is bigger than our other seeds – like love or compassion. The seed of anger may be bigger because we have not practiced in the past. When we begin to cultivate the energy of mindfulness, the first insight we have is that the main cause of our suffering, of our misery, is not the other person – it is the seed of anger in us. Then we will stop blaming the other person for causing all our suffering. We realize she or he is only a secondary cause. You get a lot of relief when you have this kind of insight, and you begin to feel much better. 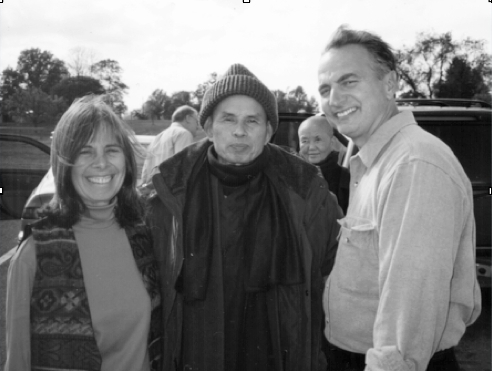 Photo: Thich Nhat Hanh with Bo and Sita from November 1999 when they took him into Maryland Correctional Institution.